CAT 2016 results declared on 9 th january 2017. 20 candidates score 100 percentile on 2016 CAT Test. Top 20 candidates are coming from Engineering field and all of them are male. In CAT 2015 17 students were engineers and 1 female was in that list. The test is the entry point into Indian Institute of Managements and other top B-Schools in India. On 4th December 2016, 1.95 lakh candidates appeared for CAT 2016. The test was conducted in 138 cities in all over India. 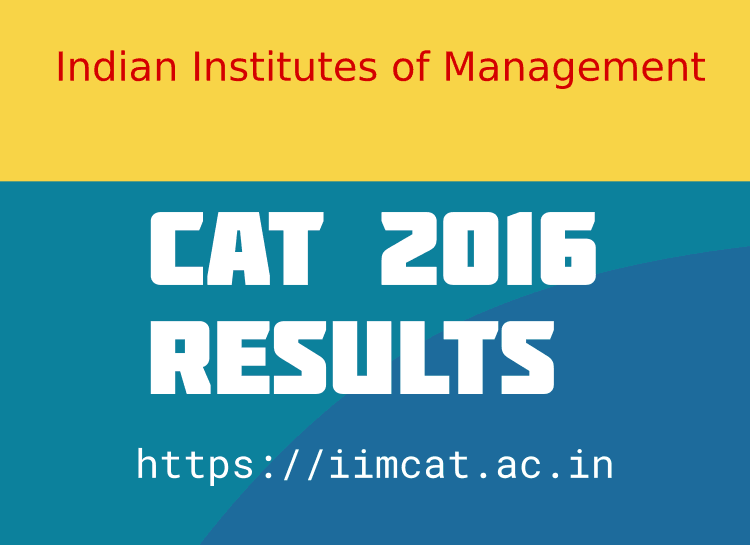 Students can access the results of CAT 2016 on the website www.iimcat.ac.in. The release also added that IIM Bangalore will announce its short-list for personal interviews on its website www.iimb.ernet.in later. Indian Institute of Management Bangalore is incharge of CAT 2016 and all the related operations. The candidates were informed individually via SMS on January 9, 2017 and CAT 2016 has also published the Score Card in its official website. The 20 toppers who scored 100 percentile, there are Avidipto Chokraborty from Kolkata and Pune-based Yash Chaudhari. Avidipto Chokraborty has scored 96.27 in verbal ability and reading Comprehension, 68.16 in data interpretation and logical reasoning and 77.25 in quantitative ability as scaled scores. On the other side Yash Choudhari, a 4th year BTech student from College of Engineering, Pune has scored 86.15 in verbal ability and reading comprehension, 60.44 in data interpretation and Logical Reasoning and 73.50 in quantitative ability as scaled scores. Selection process of CAT 2016: Each IIM shortlists candidates for second stage of selection which may be independent of each other. However the process may include Written Ability Test, Group Discussion (GD) and Personal Interviews (PI). The performance in CAT 2016 examination is an important component in the admission process. Normalization was introduced in CAT when the exam started happening in multiple batches. As the exam was conducted in two slots this time, to ensure that students who took the exam in two different batches are compared fairly while calculating percentiles, their scores are normalized to calculate what CAT score card referred to as ‘scaled score’. Further procedures of admission to various IIMs in India will continue in the following days. Students must watch the official websites of IIMs for further notifications and procedures. Official websites are given below.